The LEC R50052W Mini Compact Table Top Fridge is a stylish and compact solution, being small enough to fit on your worktop making it ideal for single living, smaller kitchens or for that extra fridge space. With a 46 litre capacity of cold storage space, it will hold up to 2 full bags of shopping and there is more than adequate space to store your essential items. The Removable wire shelf allows you to be able to organize your drinks and other bits and bobs so everything is chilled to perfection, making it perfect for individuals and parties. Comes complete with an ice box. With an Energy Saving Rating of A+ and recommended by the Energy Savings Trust, you know you are getting a really efficient appliance - costs just over £16.32 a year to run (annual consumption of 106kwh energy). Noise levels are also at a minimum with this device, emitting only 45db when running - the average conversation between two people is between 60-70db meaning this appliance is discreet. With a reversible door, the LEC R50052W affords great flexibility when placing the fridge in your home as the door can be set up to open from either the left or the right-hand side. 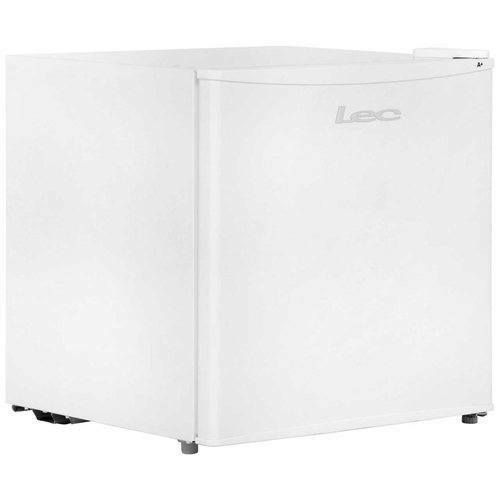 Please also see the LEC U50052W Table Top Freezer to go perfectly with this product.